What do you get your mother-in-law for Christmas, when she really doesn't need one single thing? That's what I was wondering when she came out to the beach house for a visit this fall. She happened to bring up some embroidered ornaments I had given her years ago, mentioning that they were her favorites. An idea formed. Why not make little "grandchild ornaments" for my mother-in-law for Christmas? 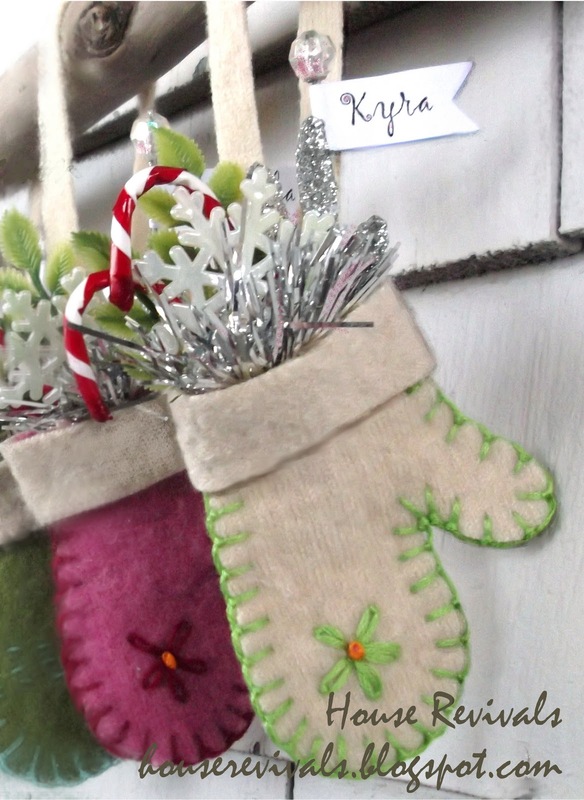 I had tons of small felted wool scraps leftover from the gift card ornaments I wrote about here. The scraps were small and I was debating whether to throw them away. Why not make a smaller version of the gift card ornaments, using the leftover materials, for my mother-in-law's gift? I love how they turned out -- about twenty in all, plus a couple of extras "just in case". Filled with festive goodies, they will look so sweet hanging on a tree or a garland! These were super easy to make -- not nearly as time-consuming as those embroidered ornaments I made years ago. Cut out two pieces of felted wool for each mitten. The cuffs and hangers are simply narrow strips of wool scraps that were glued in place. Glue some goodies (I used bits and pieces rescued from old Christmas decorations) inside the top of the mittens. Add a little name banner to each mitten and you're done! 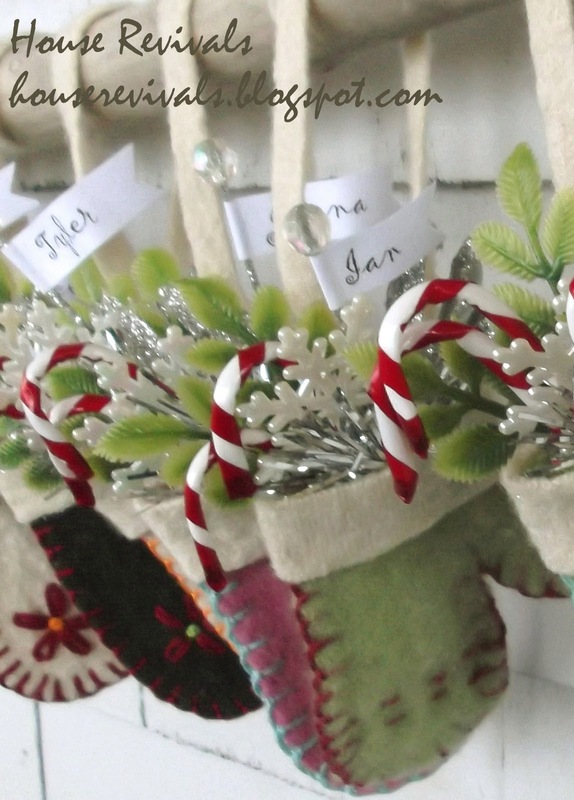 This sweet little set of gift ornaments cost virtually nothing to make. The embroidery took a little time (about fifteen minutes of stitching per mitten), but my mother-in-law is worth it. The parts that were glued together were done "assembly line" style in one evening. Edit: My mother-in-law LOVED her gift! These are so sweet. I agree they will look great on a tree or garland. How precious are these! And a lovely meaning behind them too. Love the blanket stitching around the edges, perfect! What a sweet gift, especially as you knew how much your MIL liked a previous gift of handmade ornaments. WAY TOO ADORABLE!!! Love 'em with that fabulous stitching and the lazy daisies!!! So glad Donna shared these on FB. I have done something similar in the past but did not make them open to add canes or greenery inside. Wonderful inspiration! Super adorable idea! Great way of reusing something old! Very cute, and would be perfect as a neighbour gift. These are fabulous! I would love it if you linked this up to my new party! Cute idea! I'm sure that you MIL will love these. This is such a cute idea. I want to try to make these! I am over visiting from Someday Crafts link party and am now your newest google follower :) If you get a moment, I would love for you to check out my blog and follow back. This is so cute! I would love to feature this on Reduce, Reuse, Upcycle. Feel free to stop by and grab a featured button. Thanks! Congrads! This was the most viewed link last week at thw Whatever Goes Wednesday party at somedaycrafts.blogspot.com. Im featuring it today. Grab my "featured" button. Love these! My SIL works with Court Appointed Children's Advocates (CASA). Every year she makes sure that each child has a gift. These will be so cute for the older children who get gift cards. Cindy, I love that idea! We used to donate beanie babies to our local county foster parent association for the same reason -- plus their gifts needed to be small enough to fit in a little backpack, because that is often all these kiddos had.